With pic: New staff at Geens: Hannah Sutcliffe, Margaret Furreddu, Alistair Currie, Angelina Furreddu. Geens Chartered Accountants have added four more new staff to their growing Stoke-based team. The recruitment drive includes investment in future talent with the appointment of two apprentices and is part of a long-term growth strategy. The long-established firm has added a pay roll officer and two apprentices, while also recruiting a boost to the front office function with a new receptionist and admin assistant. Karen Lowe, one of five Directors at the Liverpool Road, Stoke, company, said: “We have experienced a period of growth, adding new clients and this has generated new jobs at Geens. We have also invested heavily in IT and software to ensure that staff have the best solutions on the market to provide services to a very high standard. 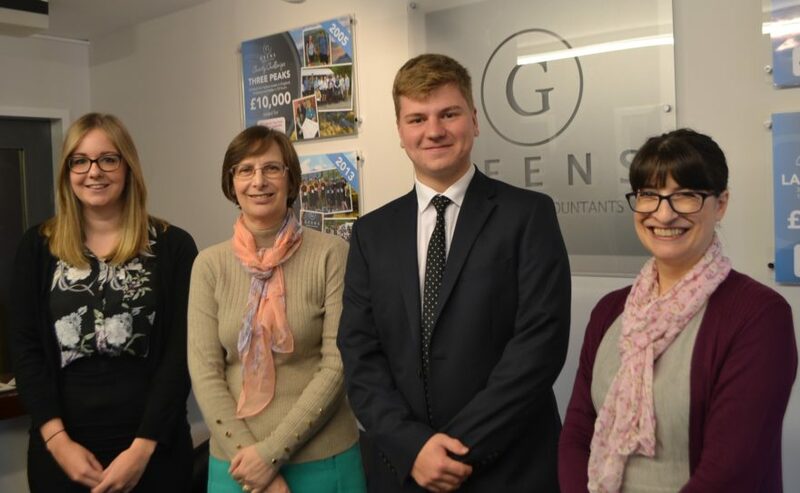 Recent new starters include Margaret Furreddu, an experienced pay roll officer who has been taken on by Geens after returning to live in Stoke-on-Trent in 2018 and apprentices Hannah Sutcliffe and Alistair Currie, who have joined Geens having both passed their AAT Level 2 exams at Newcastle-under-Lyme College, gaining Distinctions. Angelina Furreddu joins Geens as the company’s new receptionist and admin support. Geens has developed a mutually beneficial relationship with Newcastle-under-Lyme College and this was recognised as the company was named as Best Small Employer in the College’s awards programme. Geens is also working with clients to ensure they are MTD ready. Making Tax Digital, the new Government rules, will mean that most VAT-registered businesses have to complete their VAT returns with direct digital links to HMRC’s new platform. For further information about Geens, please go online to www.geens.co.uk. For media enquiries contact Nigel Howle, telephone 0776 2043436, email nigel.howle@howlecom.co.uk.